It has been suggested that this article be merged with Captiva Island. (Discuss) Proposed since December 2018. 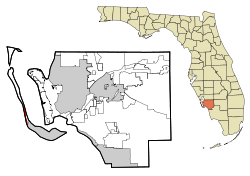 Captiva is located at 26°31′5″N 82°11′28″W﻿ / ﻿26.51806°N 82.19111°W﻿ / 26.51806; -82.19111 (26.518028, -82.191057). According to the United States Census Bureau, the CDP has a total area of 10.5 square miles (27 km2), of which 1.2 square miles (3.1 km2) is land and 9.2 square miles (24 km2) (88.10%) is water. mostly in the Gulf of Mexico to the west and Pine Island Sound. As of the census of 2000, there were 379 people, 194 households, and 130 families residing in the CDP. The population density was 305.3 people per square mile (118.0/km²). There were 1,150 housing units at an average density of 926.2/sq mi (358.1/km²). The racial makeup of the CDP was 98.42% White, 0.79% Asian, 0.26% from other races, and 0.53% from two or more races. Hispanic or Latino of any race were 0.79% of the population. There were 194 households out of which 10.3% had children under the age of 18 living with them, 63.9% were married couples living together, 1.5% had a female householder with no husband present, and 32.5% were non-families. 25.3% of all households were made up of individuals and 11.9% had someone living alone who was 65 years of age or older. The average household size was 1.95 and the average family size was 2.25. In the CDP, the population was spread out with 8.2% under the age of 18, 1.1% from 18 to 24, 14.2% from 25 to 44, 44.1% from 45 to 64, and 32.5% who were 65 years of age or older. The median age was 58 years. For every 100 females, there were 96.4 males. For every 100 females age 18 and over, there were 96.6 males. The median income for a household in the CDP was $64,821, and the median income for a family was $120,488. Males had a median income of $31,875 versus $44,861 for females. The per capita income for the CDP was $76,139. None of the population or families were below the poverty line. Travel, tourism and hospitality rank as the number one industry on Captiva Island (and its sister island immediately to the south, Sanibel). Noted world-famous guests to Captiva include Teddy Roosevelt, Charles Lindbergh (who regularly landed his plane on the beach in front of 'Tween Waters Inn), Anne Morrow Lindbergh and J.N. "Ding" Darling. Both the Old Captiva House restaurant and a number of guest cottages have been designated historically-significant sites by Lee County, Florida. The Wall Street Journal selected Sanibel and Captiva Islands as one of the 10 Best Places for Second Homes in 2010. 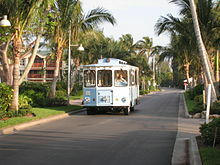 Wikimedia Commons has media related to Captiva, Florida. Sanibel-Captiva Chamber of Commerce Official site for Sanibel & Captiva Islands.